Anjali 2020 is our one year plan for continued education for our graduates, additional classrooms, proper restrooms, a Center for Visual and Performing Arts and a Computer and Engineering Lab. You can learn more about our immediate goals below, and contribute to a specific project using the corresponding links. Thanks to the generosity of our donors, we reached our first two goals in 2018! provided a year of nutritious lunches to all Anjali students. Help us reach Anjali's Goals! In the past, concluding their education at the end of 5th Grade to find manual work to support their family has been the reality for many of our graduates. We hope to change that. This year again, all of our 5th Grade students are preparing for their 6th Grade entrance exams to great government schools and private schools. 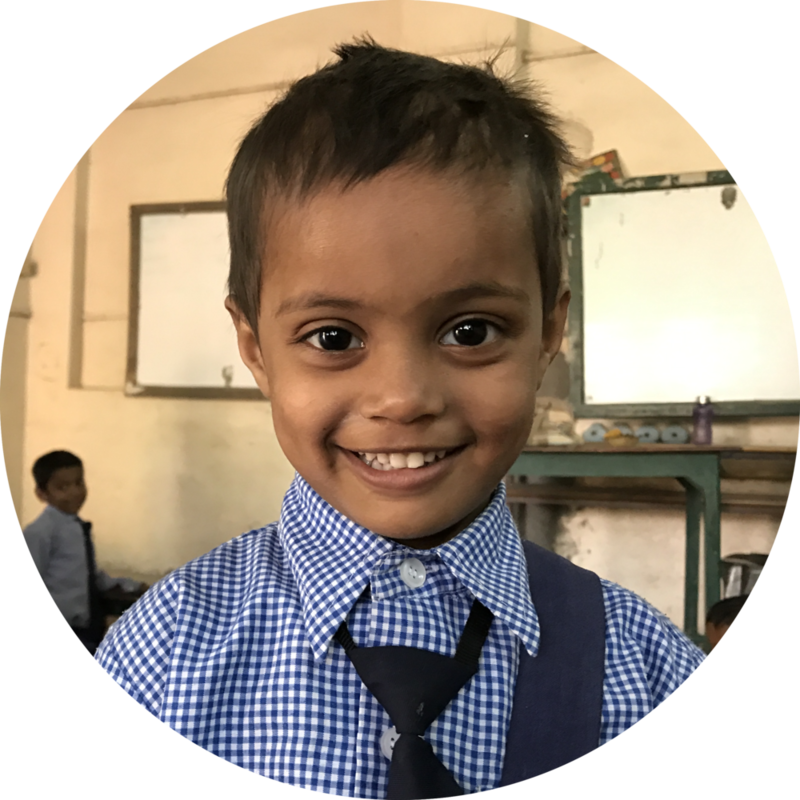 Our most pressing need is to sponsor our twelve 5th Grade students who will be graduating from Anjali in April 2019, and with your help, will be beginning 6th Grade in May 2019. Annual average tuition at a secondary school is Rs25,000 ($365); the next Rs350,000 ($5,000) raised through the Anjali 2020 Campaign will be allocated to support our current 5th Grade students after Anjali. Thanks to the generosity of our donors, we sent seventeen 5th Grade students to 6th grade in 2018! Help us send twelve 5th Graders to 6th Grade this May. School Year 2018-2019 — This goal has been met. Yes, I would like to contribute for the School Year 2019-2020. Most of our students go the whole school day without a snack, much less a proper meal. For Rs1,400 ($20), we can purchase enough rice and lentils or yogurt and fruits to feed all students a nutritious meal during recess. For Rs350,000 ($5,000), we can ensure that all our students receive a proper meal every day during one school year so that they can get the most out of their classes. Thanks to the generosity of our donors, we provided a year of nutritious lunches to all our Anjali students last year! Help us feed our students again this coming academic year. Anjali School has 4 classrooms (temporary structures with tin sheet roofs), yet serves students from PreKG through 5th Grade (7 grade levels). Different grade levels are often taught concurrently in the same room. Other times, grade levels with no classroom are taught outside on mats. At least two grade levels a day are taught outside, and sometimes more depending on how many students are present that day. With Rs3,500,000 ($50,000), we can build two permanent, modern classrooms with doors and windows, proper lighting, paint, and flooring, desks and chairs, a whiteboard and a projector. With the additional Rs350,000 ($5,000), we can build proper sanitary and private bathrooms, with running water and soap, for our students and staff. Yes, I would like to help build a new permanent school. Right now, Anjali teaches through 5th Grade. But education doesn’t end at 5th Grade. Our goal is to support those students who are unable to afford their continued education, and ensure that all of Anjali's graduates complete their studies through 12th grade. This fund will provide partial to full scholarships to all the students who would otherwise discontinue their education to find manual work to support their families after graduating from 5th grade. Yes, I would like to contribute to continuation scholarships. A creative space devoted to the empowerment of our students through artistic expression. This center will support our students in finding inner peace, developing confidence in themselves, discovering their creative abilities, and fostering a greater appreciation for the arts in traditional Indian culture and other cultures from around the world. Given the backgrounds of our students, a safe space for imagination and self-expression through art, music, dance, and acting can be a stimulus for healing and growth, and a place to find enjoyment and peace away from the realities they may experience beyond school grounds. Yes, I would like to contribute to the arts center. Too many students throughout India enter their University studies without computer literacy, or no prior experience with modern information technology. Our dream is to build a modern, WiFi-enabled computer lab with 20 laptops, a projector, and engineering tools and materials to be accessible by and inspire all students to dream, design, and bring to life real projects related to STEAM (Science, Technology, Engineering, Arts, and Mathematics). Students will learn how to use computers and related technology, through curriculum ranging from basic computer skills to advanced coding, as well as hands-on engineering projects in electronics, computer-aided design (CAD), and 3D printing. Yes, I would like to contribute to the engineering lab.